Stolenspace Gallery will be presenting two solo shows on Friday, March 2, 2017. One of which will be Jamie Evans’, “Something Different, Something New” whom I have interviewed last week. 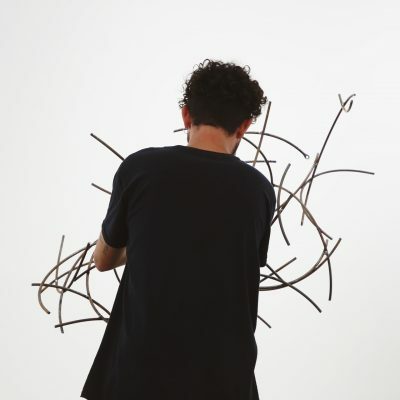 In contrast to this show, Kevin Cyr will be showcasing his work as well. 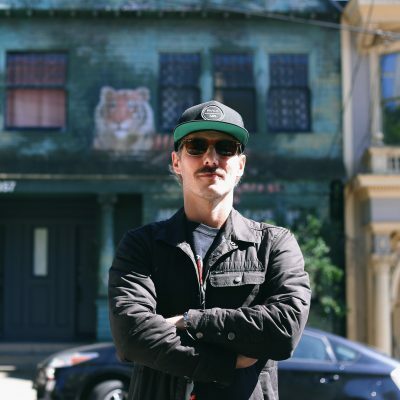 He has dedicated his craft in portraying decaying vandalized delivery vans from various cities that he’s been to. As an artist moving in and about the industrialized worlds, Kevin Cyr found fascination in commercial vehicles from his daily encounters. In his show, titled “Common Ground”, Kevin dares to show subjects that has beauty in the depressing rapid decay of a neglected thing, something familiar to us. He gives his audience something to ponder; something one might easily ignore and easily dismiss in this visual environment. Kevin paints a picture of delivery vans that focuses only on what we’ve been ignoring all along — the unnoticeable objects, the quotidian — that we barely set our eyes on. 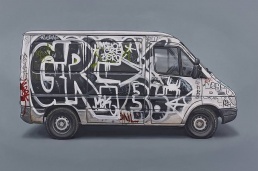 Expect painted lateral portraits of vans, vandalized and tagged with layers upon layers of monikers. Amalgamations of grit and hard-labor stories beautifully placed against solid toned backdrops. Perhaps the artist metaphorically guises these vans as the people who utilizes them. If so, he succeeded. Kevin Cyr’s art is revealing, sentient, and nostalgic. Hey Kevin! Tell us about your upcoming show ‘Common Ground’. What is it about? The painting featured in this show all share a common purpose, work. From NYC vans, Parisian and Berlin delivery trucks covered in graffiti to the Cuban Chevys repurposed as Taxis. These are all vehicle that tell stories of place through their dents, rust, and graffiti and represent the hard-working aspects of culture. The best piece of advice I heard about vehicles was from a guy named Eduardo in Brooklyn. He told me, “Never buy a car that doesn’t make you money”. He proudly told me how he bought his Ford Van 15 years earlier for 300 bucks and the next day he made $700 hauling stuff. 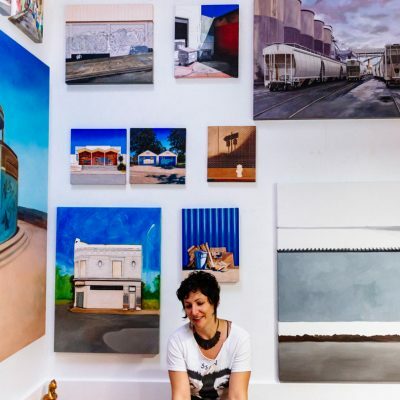 This grouping of paintings evokes that spirit of pragmatism. 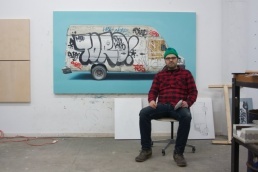 How did you get to be known as ’the artist who paints vans’? It was a slow evolution from painting a wide variety of subject matter to ultimately carving out a niche for myself. 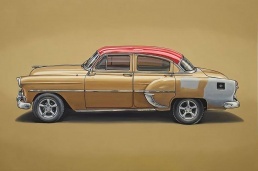 I began painting vehicles about 15 years ago as a way to document interesting cars and trucks I’d come across–before they were junked. From the beginning I found one could tell a lot about a place through the vehicles found on it’s streets, vehicles gives a place it’s character much in the way store fronts or industrial buildings do. Once I moved to Brooklyn, my focus narrowed even more to focus on vans, especially the graffiti covered vans which are so ubiquitous in New York. They represent a vibrant street art culture, a strong working class and New York toughness that isn’t found in too many other places. What is your favorite piece in this show, and why? 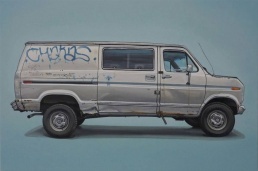 The painting of the silver Ford Econoline titled, “Judge” is definitely one of my favorites. It’s so understated but it has so much personality — the crooked antenna, the faded blue tag, just the right amount of dents and rust. I came across it unexpectedly in Queens, on Judge Street, and its one of the vans I’ve wondered about it’s use and owner. “Common Ground” will have an opening reception on Thursday, March 2, 2017 at 6-9PM. And the show will run ’til the 2nd of April.